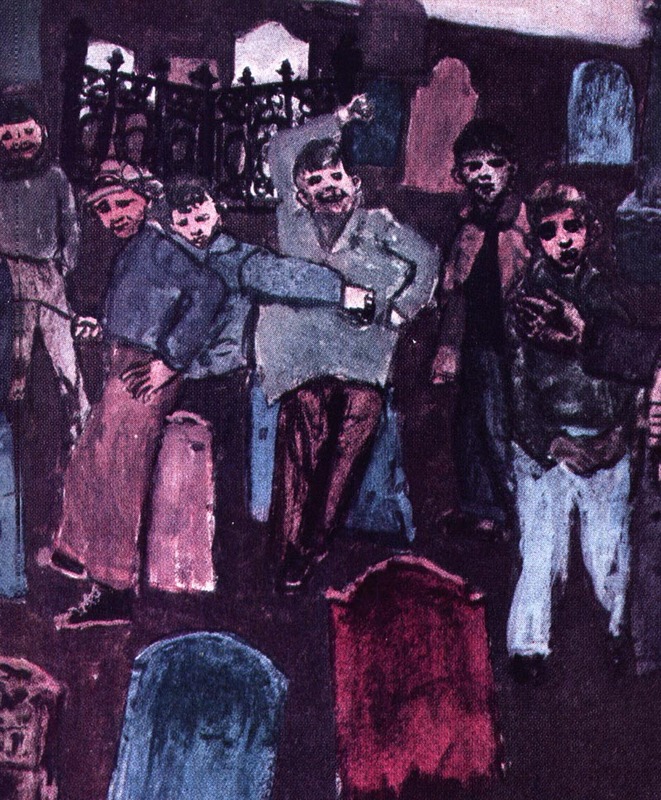 Today's Inspiration: Robert Weaver: "Illustration is an essential to great painting." Robert Weaver: "Illustration is an essential to great painting." As predicted, yesterday's post provoked some strong reactions - some enthusiastic, others a bit ornery. Readers asked, "why the controversy?" and wanted to take me to task for suggesting Robert Weaver might be somehow better (or even just different) than NC Wyeth. In fact, my real intent was misread - I have little doubt that Robert Weaver could have admired NC Wyeth's (or Howard Pyle's) work and that these artists actually had more in common than we might expect at a glance. That being said, the elephant in the room that has to be acknowledged is that the classical style of illustration, the tradition that came down by way of NC Wyeth and a thousand commercial artists who 'descended' from him, was, by the mid-century period, becoming irrelevant. While Robert Weaver may have admired Wyeth and Pyle, I get the feeling he had little more than disdain for their 'descendants' - for the Sundblom Santas and the Whitmore 'clinches'. 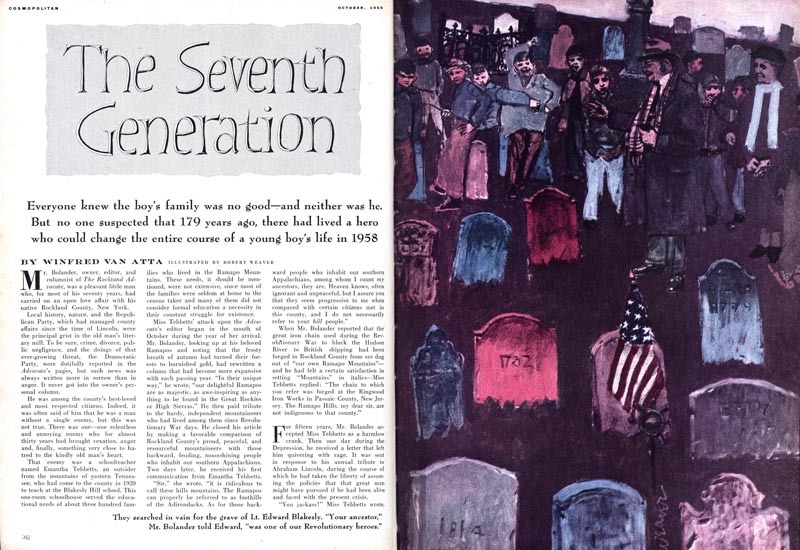 Describing his take on the state of illustration in a 1959 interview in American Artist magazine Weaver said, "Many illustrators of today are too little concerned with the actualities of their time." "Too often they merely aid and abet the pre-sold illusion of the age. The illustrator, who should be outside momentary surface illusions observing, is himself observed as part of the phenomena by more serious students of the time." By "serious students", Weaver was not referring to the contemporary fine artists of the day, by the way. Of that crowd, he said, "Today's artist finds himself unattached to society. There is no mutual sense of responsibility He is 'free.' He likes it that way." "Is it not that very freedom that has robbed art of its raison d'etre? I have noticed that abstract expressionism carried to the most reckless extremes no longer has the power to shock and disturb even the most conservative audiences. Ennui sets in." "Illustration is an essential to great painting. Abstractness cannot be equated with it; it is merely the grammar. Color, texture, design, etc. are tools to be applied to a purpose. 'Self expression' is not a purpose, it is an inevitable by-product of that purpose. It is at this point that the illustrator-painter should realize his opportunities." "That he has not realized them is borne out by the low opinion in which the illustrator is held in the general art world." * My Robert Weaver Flickr set. (1) By example, consider the story of Murray Tinkelman luring, one by one, the Cooper studio artists away to Reuben Tam's painting class at the Brooklyn Museum. In Neil Shapiro's article in Illustration Magazine # 16, Cooper artist Don Crowley described Murray's influence (somewhat facetiously) on the Cooper staff as "[getting] those guys dissatisfied with what they were doing... they weren't happy doing illustrations any more. They wanted to be fine artists." NOW you've done it!!! Never liked Weaver from the git go and now have clearer reason for my total rejection. He's a revisionist, an insurrectioist, an intellelectual terrorist, and he's dead, dead, wrong. I don't care how clever, avant garde, how 'supposedly superior' he feels about his art....it was a commercial loser in the real world. That always creates a bitter loser. His pronouncement that by the mid '50s illustration as we practiced it 'was dead' demonstrates such a distorted view of illustration, of people, of artists, of the real world, the economy, of how we lived and communicated in the mid-century, that his opinion is nothing less than pathetic. Will stop and cool off for now....more later. Love Weaver! Thanks for the recent posts! I was fortunate to hear Barron Storey speak on him and it was phenomenal! I like him. an influential instructor to Barron Storey....that is victory. I wonder where Robert Cunningham fits in the timeline I really love his stuff. I think the thing that a lot of people miss about Mr. Weaver is that he didn't become an illustrator until he was in his thirties, and it was purely by accident. He was an intellectual from all accounts that I have read and incredibly well read. I think he was trying to get into his pictures something of the real world. Whether he did this through direct reporting or creating pictorial paradoxes that challenged readers, the intent was the same. 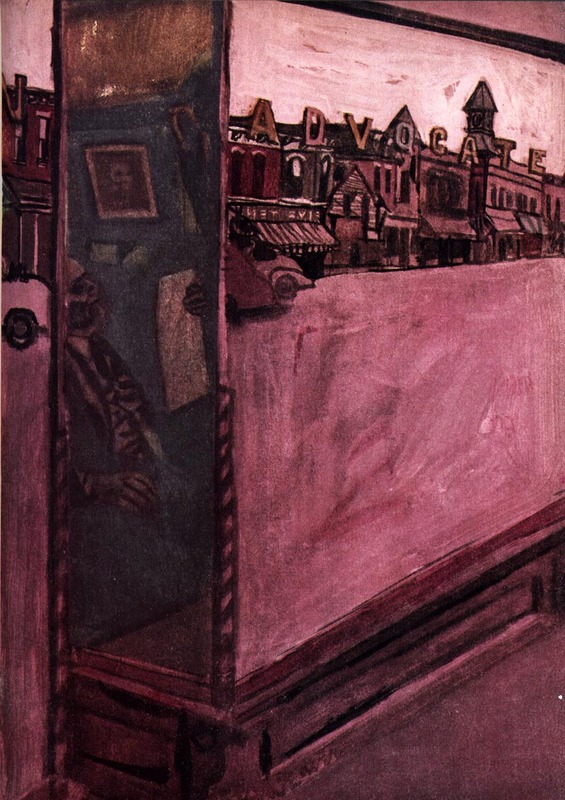 I think that more than any other illustrator at the time, and before anyone working in print, he painted the world in a way that reflected a commitment to being truthful about things he saw. I believe he was socially conscious, sensitive to the changes of his times, and trying to find new ways to make pictures. My understanding of 1950's illustration is that it was mired in a very posed and hollywoodish view of the world. If one looks at movies of the mid fifties and early sixties with clean sets, very high gloss color, and a plastic feel, I think one will see that illustration before Mr. Weaver reflected them more than real life. I don't know why anyone would call him revisionist. What was he revising? I don't know what an intellectual terrorist is. Is that someone who goes around bullying people by saying they are smarter than them? I think he was trying, and tried throughout his life and career, much of which was very successful, to find new ways to communicate. I think also that after he stopped practicing illustration in the 1980's that he began to make work that was purely for himself, and more self expression than communicative. As an illustrator, I have struggled through various forms of picture making. I have created work that is metaphorical, allegorical, symbolic, surreal, and also very graphic. The mode i am in now is one where I am trying to find a way to make pictures that feel like experiences and truths. I do not use the same language i used when I was creating emotionally charged, in your face pieces. I used to want to hide how my work was done, have that be the magic, but now, the fact that a thing is a drawing, painting, whatever is part of the thing itself. I think that making pictures or other art objects is a personal journey. I think that for Mr. Weaver, his was traveled in while making images for other people for years, then for himself. I don't get the impression from everything I have read of him that he thought he was superior to anyone. If he did, well, I have seen lesser artists act as though they were in search of the holy grail while others were just hacking about. Snobbery is part and parcel within in any field, and people take sides and prop up their heroes verses their enemies'. Anyhow, thanks for the post. 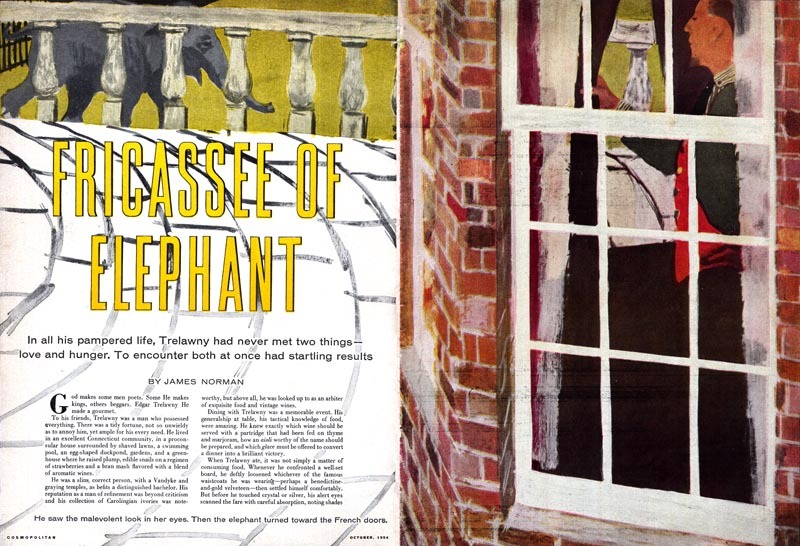 I have seen a lot of Robert Weaver's work, but not some of the more cartoonish pieces like the ones in the elephant story. One last thing, and this is my own definition of the difference between "fine art" and illustration. As I see it, illustration is a thing that supports and illuminates a given subject matter, usually in print of some form but not limited to it. Gallery work is another completely separate endeavor, as is theater for example. Both things are about connecting to and communicating. Fine art, if such a thing exist, is the state of grace that comes when one is making things and the response of the viewer. 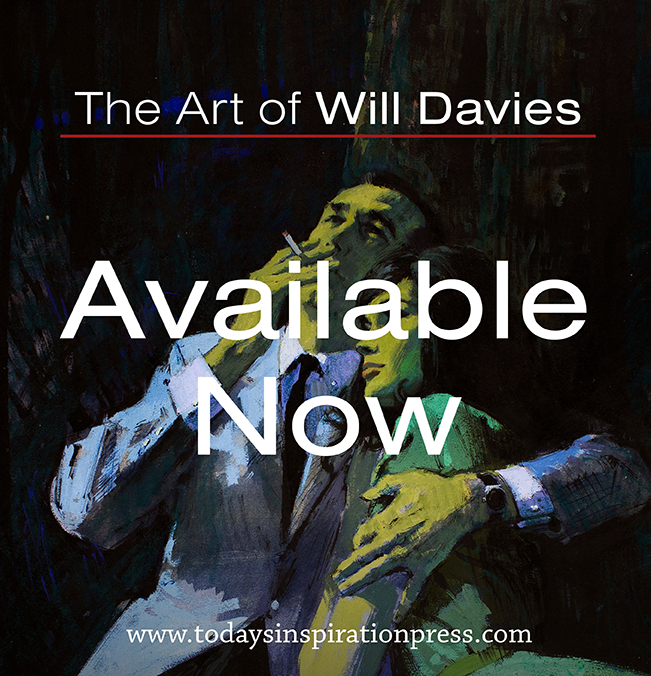 I think that painting for one's self, for galleries, for print are all worthwhile pursuits. Different, but all equally valid. Thank you all for your powerful reactions! I hope you'll continue to add your thoughts as the rest of the week unfolds. Weaver's critique is designed to appeal to the snobbish end of the illusrtration industry. In a nutshell the ethos is/was 'if it's ugly and 'badly' drawn it's a more authentic truer statement. In the process showing up well executed work as trivial or decorative. I'm not too keen on images of rosy cheeked children or Grace Kelly-esque housewives, but then you have unsentimental realists like Sickles, Smith and Fawcett doing great work. Weaver should have focused on gallery work where he could display his conscience untramelled by editorial guidelines and not be part of the uglification of a great period in American art. RW began as a fine artist and it is seems entirely valid to me to critique him as being a bit of an alien to the illustration scene, harboring a lot of shame at being in a field then derided for the undeniably schlocky part of it that gave it a bad name among the culture critics. But I agree with Chad Sterling that RW, by creating the flip side of the coin with the anti-illustration style, simply replicated a new kind of mannerism, equally open to charges of shallowness. Poor Weaver! If you listen closely to what he was saying, he was really trying to mediate between the polarity of fine art and illustration. He knew there were problems with both sides of that battle, and tried to find a compromise, a way out. I too have doubts about his success, as I find a lot of his work a little too self-conscious and glib in its rejection of traditional draughtsmanship.